I finally had to change out a set of lamps in my primary rig, which uses the 4 foot long, Solacure SG-1-40. Most of the time, I run it at 32 watts, but also run it at 60w at times, and I choke the air flow, so it is a bit rough on the lamps. I rate the SG-1-40 lamps at 1600 hours at 40-50w, but I managed to get 2200 hours out of them this time. Keep in mind, I don’t cycle the lamps on and off a lot, which is what kills lamp life. Instead they run for days or weeks at a time, which is what builds up a lot of heat. Your mileage will vary of course, but this just further demonstrates that you should get a minimum of what rate the lamps at, and how cost effective they are. I had planned a beautiful spalted maple over cherry wood project, but there was an accident with the luthier, ruining the wood, so I had to go to Plan B. 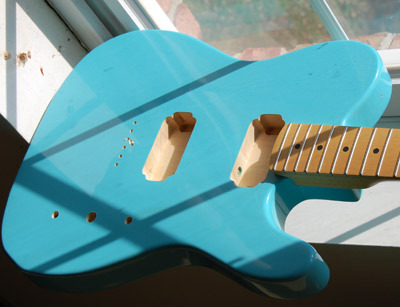 For this plan, I’m going kind of cheap, for a fun little project; a home made Cabronita Telecaster. I aged it down for around 3 days, and it looks a lot better, warmer, darker and more expensive. This was just using a low power rig, 6x 32w lamps, SG-1-40s with a lot of hours on them. Aging necks and the like is easy stuff. The thicker the finish, the slower it will age, and finishes that have the antique vintage tinting to them will likely take a very long time since the tinting obscures the UV. Personally, I hate fake tinting. It is just too easy to age it with real light. Next, I decided to use some Gretsch pickups. Gretsch Blacktop FilterTron G5400, to be exact, the same used in the Tim Armstrong signature guitars. These are actually quite nice, and I found a great deal on them, $65 shipping and all, so I couldn’t argue. They give the guitar a twisted Cabronita sound and look. The rest of the hardware I will figure out later, I have plenty of parts in the spare parts bin for a bridge and the like. Started putting the nitrocellulose over the urethane finish on the blue Telecaster, and there was NO curling up of the finish. That is a problem with some finishes, but I had it on good authority that I could maybe get away with it on urethane. This means that coating the necks shouldn’t be a problem either, as they always have a urethane finish. Once dried, I will try to finish check the nitro, to make it look like an old Daphne blue guitar, to age the top coat. I have to add the nitro to do this, urethane won’t age, it will just fade a bit. Next, I will do the same with the neck, which had a light sealer or coat of urethane on it, but I want it aged before I put the nitrocellulose clear coat on. I’m thinking this will make a really interesting cheap guitar. Not sure if I will keep it or set it at cost of parts and finish materials when I’m done. I already have a couple of Cabronitas, but this has the promise of being something really unique, yet really inexpensive. Something that is worth more complete than the parts would have you believe. A lot of people still pine for the days of nitrocellulose finishes on guitars, swearing they sound better and look better. In fact, nitrocellulose was only one kind of finish they used on 50s/60s Fenders, the other was acrylic lacquor, which is more colorfast. Some colors only came in acrylic (like Lake Placid Blue) while others only came in nitro (like Sonic Blue). They were using car paint on guitars, after all, so they ordered what was available because it was cheapest, and Leo was notoriously frugal. Acrylic is actually a better product as it resists fading, cracking and chipping, but that is exactly the opposite of what everyone wants, it seems. Everyone wants a guitar that will soon like it is 40 years old, even dipping parts in acid to age them. Even our lamps are designed to speed up time. Just about any of our lamps will work to age a nitro finish, although the SG series are the fastest. We are going to be doing some detailed finish tests in the months to come, so stick around. We will always publish the details in the “how to” section of the main website as well, which is probably easier to search. 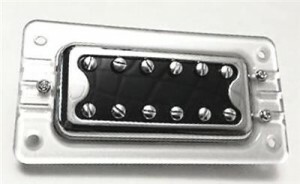 Those of you relic’ing guitars or just aging them down really do need to take a look. We’ve been testing and working with this for over a decade and have a pretty good idea of what can be done. See our Projects page for actual photos and examples. Wood doesn’t lie. 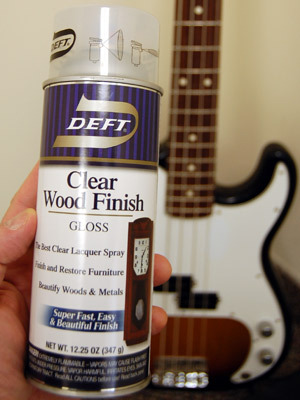 I’m going to test using some Deft nitrocellulose lacquer, and I’m going to take my personal 2005 US built Fender Precision Bass with factory nitro finish (Highway One model) and subject it to thousands of watt hours of ultraviolet to see if we can induce some aging, fading, cracking, or whatever else happens. I can’t think of a better way to show trust in my lamps than putting my main bass guitar through the gauntlet. It has a small ding or two plus some yellowing of the pickguard, but it has never been through what I have planned. Be sure to bookmark the Projects page (linked above) and check back. Cluster of female cannabis flowersYou’ve probably found yourself here because you’ve heard that ultraviolet might increase the potency of cannabis. You might have also have heard some people say it isn’t true, and you are curious as to whether or not it really does. The purpose of this article is provide you some information, and some citations demonstrating the concept and why it really works and works extremely well if you do it right. The science behind the idea dates back to the 1980s and perhaps earlier, so this is a summary of that research. Much of this might be a bit of an oversimplification, but the goal is to give you an overview of why proper UV works, it isn’t to be a science class. When we talk about ultraviolet and increased potency in cannabis, we are singularly talking about THC (Tetrahydrocannabinol) production. The effect of UV on the other 84+ cannabinoids isn’t fully known, nor has it been studied in detail. One would assume that if you increase the amount of THC, you are probably lowerin the amount of other cannabinoids (in particular, CBD or Cannabidiol), but this is just conjecture and the adecdotal evidence is conficting. Growers who are trying to produce marijuana that is moderate or low in THC but high in CBD would actually want to avoid ultraviolet, which explains why it is always grown in greenhouses (whose glass filters out all of the UVB and most of the UVA). Most growers, however, are wanting to grow cannabis that is high in THC, whether it is for medicinal use or recreational use. This article applies to them. Most plants on the planet have both male and female flowers, making them hermaphrodites (monoecious). Cannabis is one of the rare plants that has individual genders, both male and female plants (dioecious), although some plants will have both male and female flowers. The female is the grower’s target, and growing largest and most potent flowers (buds) is the goal. To this end, all males are removed, to prevent the female from going to seed. The key is, no one has told the female that she will never be pollenated. As far as the female plant is concerned, her flowers/buds are the bed for her children (seeds) and she simply hasn’t been pollenated yet. Her seeds are the only way she can reproduce, and reproducing is the primary purpose of every plant. As such, she will protect that flower as if it has her children in it, even before it does. Like most plants, cannabis has built in protection mechanisms to guarantee the next generations, which takes us to THC. That THC is psychoactive is perhaps an accident. This quality hasn’t necessarily benefitted the plant, except those qualities has insured that man has cultivated the plant for thousands of years. THC has a biological role for the female plant that is critical for you to understand: THC has very high UVB absorption rates, meaning it is like sunblock for the plant. The ultraviolet spectrum is broken into three bands. They are actually “colors”, we just can’t see them. Like colors, there is a range within each color. This is how “pink” and “burgandy” are both types of red, just different parts of the red spectrum. The same for ultraviolet. If you look at a rainbow, you see the colors go from deep red (wavelength of 700nm) all the way to violet (400nm). The next color is UVA (320nm-400nm), then UVB (280nm-320nm) and finally UVC (10nm-280nm or 100nm-280nm, depending on who you ask). UVC is used for water purification and such because it kills organisms. It can also give you a flash burn in a few seconds, so fortunately, the atmosphere filters out almost all of it. When a plant is outside, they get a fair amount of UVA and UVB, typically in a ratio that is around 5% UVB and 95% UVA. They have evolved over millenia to adapt to this and survive. In the case of cannabis, the plant developed THC to protect the next generation. The more UV it is exposed to (to a point), the more THC it will produce. In order to increase the THC, you need to understand that plants aren’t lazy. They spend all their time doing something: growing tall, growing buds, creating THC, moving nutrients around and such. When you introduce the proper spectrum of UV to the plant, you are forcing it to shift its resources into protecting itself. It will spend a little less time growing sun leaves, sugar leaves and even the buds will be more dense and just a hair smaller, but it will produce a lot more THC. Since THC is the ultimate goal, the market potential is significantly higher for plants grown with proper UV. It short, it makes you a LOT more money. Using proper UV can cost you $5 to $10 per plant when you average out the cost of lights and fixtures. It is very cheap. Most people are able to get increases of 20% THC the first time they use it. Most experienced growers are getting over 30% more THC than with clones that aren’t getting UV. These aren’t guesses, our dispensory and grower customers report back to us with actual lab results, using actual control growing methods. Anyone who tells you they didn’t get more THC is probably using a reptile light or some similar underpowered UV source. Just as you can’t use regular screw in light bulbs to grow robust plants, you can’t expect high THC returns with weak UV sources. Ironically, the bad UV lights cost about the same as the good ones, it is just a matter of using the right lamps, the right way. And it is pretty easy IF you know how. With our standard 4 foot bulbs (Universal UV and the SG-1-40) you will use four bulbs for every 1000w (or equivalent) hood you have. Newer lamps in testing will cut that in half. It takes more than just random UVB. We have found certain frequencies of UVB make the plant react more vigorously than others. We have reason to believe that UVA is also beneficial. While it doesn’t stimulate THC production, it penetrates much more deeply than UVB and may stimulated trichome production, which makes THC possible. This is why we have UVB lights with multiple “soft” peaks at the right frequencies, as well as strong UVA output in exactly the same part of the spectrum that the sun is strongest at. This gives you a sun-like glass tube that you control. So does it work? Unquestionably it works as long as you use the right power level and right frequencies, and the pay off is often 100x the investment. This is huge. This is also why many growers are using our lamps, and why many growers don’t let anyone know that they are using our lamps: They don’t want anyone to know their secret, why they get the big bucks, why they have the best product. Of course, it still takes good light, good water and soil, good care and air, and proper technique, but UV light is just as important as those other things if you are after premium results. I’ve been working on a new page to help in picking the right lamp. There are so many applications for each lamp, it is pretty easy to get confused, so trust me, I understand. This is compounded by the fact that we make our lamps able to run on many different wattages, letting you get the most power of of them, so matching then with ballasts can be confusing. Click on that new link above if you have questions, I think it helps narrow it down for you some.